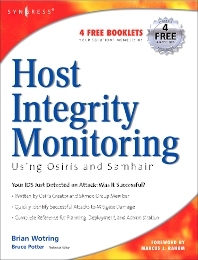 This book will walk the reader through the process of preparing and deploying open source host integrity monitoring software, specifically, Osiris and Samhain. From the configuration and installation to maintenance, testing, and fine-tuning, this book will cover everything needed to correctly deploy a centralized host integrity monitoring solution. The domain includes home networks on up to large-scale enterprise environments. Throughout the book, realistic and practical configurations will be provided for common server and desktop platforms. By the end of the book, the reader will not only understand the strengths and limitations of host integrity tools, but also understand how to effectively make use of them in order to integrate them into a security policy.